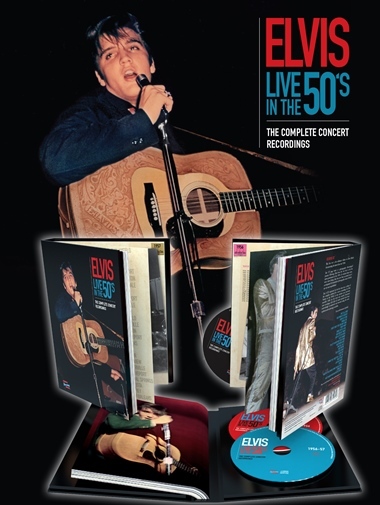 'Elvis Live in the 50’s The Complete Concert Recordings' is a high-quality 3CD and 172 page book combination. The book includes tour details (date, town, venue) and all photos are annotated. The eclectic range of venues Elvis appeared at is striking, from various high school halls, air force bases and the Catholic Club to quaintly named outlets such as Porky’s Rooftop Club and the exotically named Reo Palm Isle. The customary range of press clippings is a powerful record of 1950s publicity ads, ticket stubs, receipts and show reviews. The three packed CDs feature every recorded live performance by Elvis in the fifties - with the exception of his TV appearances. They take you on a journey from his first nervous live performance on the Louisiana Hayride in October 1954, through to his final all-conquering December 1956 concert at the Louisiana Fairgrounds - along with a few bonus fragments of Elvis live in 1957. Elvis Live In The 50’s The Complete Concert Recordings, Memphis Recording Service (MRS), Text by Joseph Pirzada - Housed in Hardcover box, 3 x CD and 172 page book - with quality lock-in CD holders. Joseph Pirzada, the force behind the Memphis Recording Service (MRS) label and publishing house, has released his latest tour-de-force! Elvis Live in the 50’s The Complete Concert Recordings is an exquisite 3CD and 172 page book combination which not only lives up to its title, but also exceeds it by offering a tight, profuse narrative-visual record (in chronological order) of the young Hillbilly Cat at his frenetic and explosive best. The release is neatly packaged in a larger than pocket sized (140 x 190 x 28 mm) hardcover box set, making it convenient to both store and easily carry around. The book’s thick paper stock features a colourful array of imagery and informative text. The page design is strong with images and text nicely presented. 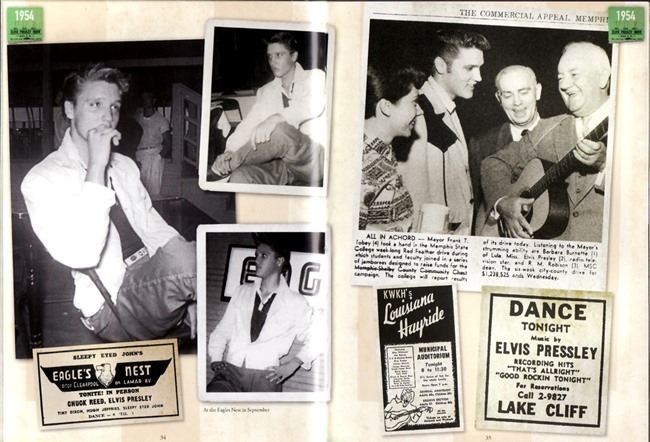 The visual element features an array of photos (numbering in the hundreds), most of which appear to have been included in MRS’ superb and long “sold out” two volume set: The Beginning of Elvis Presley – The Birth of Rock N’ Roll Volume 1 1953-1954 and The Rise of Elvis Presley Volume 2: 1955. We are told there are several previously unpublished images. The narrative is a uniformly strong one (with only one or two blemishes). While I did not do an A-B comparison with the text in the earlier MRS volumes (my copies are in storage), the text is a richly rewarding one. The Written Word: The book component includes tour details (date, town, venue) and all photos are annotated. I didn’t spot any incorrectly annotated images. The eclectic range of venues Elvis appeared at is striking, from various high school halls, air force bases and the Catholic Club to city auditoriums, outdoor jamborees, quaintly named outlets such as Porky’s Rooftop Club and the exotically named Reo Palm Isle. The customary range of press clippings is a powerful record of 1950s publicity ads, ticket stubs, receipts, concert financial information and show reviews. After the recording of Elvis Presley’s initial demonstration disc ‘My Happiness’ in 1953 and his first commercial record ‘That’s All Right’ recorded for Sun Records on July 5th 1954, fame would still be a very long way off for Elvis and the struggle for success was much harder than the general public today realises. 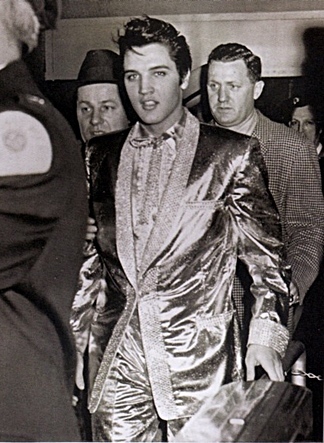 Elvis was brought to the park in a police car and when fans learned of his arrival, they stormed the car. When he finally took the stage, pandemonium broke out as fans broke from their seats and swept to the stage. After asking them to politely return to their seats, Elvis told the crowd, ‘you know those people in New York are not going to change me none. I’m going to show you what the real Elvis is like tonight’. Nothing took his breath as much as the sight of the crowd. He had played large crowds for sure, but this crowd, his hometown crowd, was overwhelming. On the last night of the Florida tour on May 13th, Elvis announced to the audience of Jacksonville’s 14,000, “Girls, I’ll see you backstage”. Immediately the girls in the crowd went crazy in full riot and surged forward after him. ....but after Friday’s March 29th performance at the Kiel Auditorium in St. Louis, Elvis would seldom wear the trousers again as he found them uncomfortable and restricting as the Colonel asked him not to drop to his knees while performing which caused the gold leaf to flake off. Importantly, Pirzada achieves a welcome balance between the necessary descriptive account of Elvis’ career progress and the equally necessary, percipient analysis of strategic issues affecting that progress (for example, noting at one point that Elvis’ appearances on the Louisiana Hayride were holding him back). The moment Elvis moved from support to headline act, while almost casually observed by the author, has a profound impact on the reader. Similarly, that Elvis, Scotty and Bill headlined (in front of 14,000 screaming fans) a charity show at Russwood Park on US Independence Day in 1956 is made even more significant by the fact that there were more than 100 (yes 100!) other acts appearing as part of the show. Whether it be touring, recording, marketing, touring or down-time, there is a well rounded account of the Elvis story, circa 1950s, to be enjoyed. The Music: The package features every recorded live performance by Elvis in the fifties, with the exception of his TV appearances. All three CDs feature over 70 minutes of Elvis’ early on-stage live concerts and take you on a journey from his first nervous live performance on the Louisiana Hayride in October 1954, through to his final all-conquering December 1956 concert at the Louisiana Fairgrounds (along with a few bonus fragments of Elvis live in 1957) - it is one incredible rockin’ trip. Even better when you can compare the music to the visuals! It is of course astounding that Elvis' first Louisiana Hayride appearance was recorded in such good quality. In October 1954 Frank Page noted to the audience, "hey've been looking for something new in the folk music field for a long time” yet within the year Elvis had not only left behind any “folk music field” but had created the core sound that would blast the excitement of Rock 'n' Roll to this faithful fans - as witnessed by the sensational recording of Eagles' Hall March 1955. Even though Elvis was still labelled as the “Bopping Hillbilly” at Eagles Hall, nothing about the performance was hillbilly! Starting with the first Louisiana Hayride show CD1 covers the crucial touring years of 1954 through to October 1955. It is fascinating to hear the May Axton interview with Elvis from July 1955, months before she composed the groundbreaking ‘Heartbreak Hotel’ for him. Another bonus is the “Radio Spot Commercials” a few of which were new to me. Highlights of the first CD are plentiful and it always fascinating to hear songs that Elvis did not record in the studio but would play on the road, such as ‘Tweedlee Dee’, ‘Maybellene’, ‘Hearts Of Stone’, Little Mama’. Eagles’ Hall in March 1955 has always been a favourite recording. The very first version we have of ‘I Got A Woman’, nine months before Elvis would lay it down in the studio. It also includes the sensational ‘Good Rocking Tonight’ and ‘Baby, Let's Play House’ with Elvis singing the lascivious “Come on back with me, little girl - so we can play some house” causing female shrieks from the audience. While some of the acetate recordings are not so clear, they have certainly been restored to the best possible quality so far. ‘Hearts Of Stone’ has notable less background acetate noise that the SONY version, while the damaged July 1955 ‘I’m Left, You’re Right, She’s Gone’ has been fixed up with a more complete edit than the official ‘A Boy From Tupelo’ version. The Eagles’ Hall performance also sounds crisper with less high-end filter on this MRS release. The August 20th 1955 Hayride performances are also some of the best and in great audio quality too. By now the band has total confidence and everyone is having a ball and even if he knew he was live on the radio Elvis joked, "I’m sick, sober and sorry". ‘Baby Let’s Play House’ is again fabulous with lots of hiccupping and laughter plus a great audio balance with Scotty’s Moore’s guitar and Bill Black’s bass rockin’ out. For the final ‘That’s All Right’ the by now confident band plays around deliberately messing up the intro of the song and with Bill Black joining in the fun and really slapping his double-bass – another sensational performance and listen to the crowd roar. 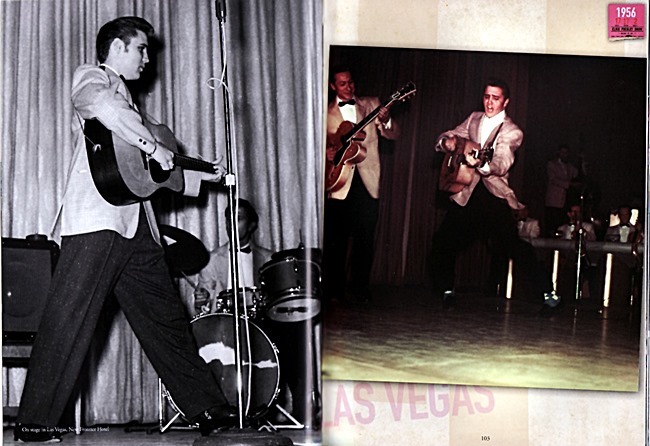 CD 2 kicks off with the familiar May 1956 Las Vegas New Frontier Hotel performance and runs through to September 1956 and Elvis’ Tupelo Fairgrounds afternoon performance. 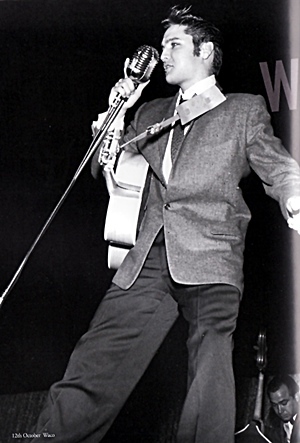 By May 1956 ‘Heartbreak Hotel’ had hit number one and the demand for Elvis’ live shows had reached another level. Yet with over 40 concert performances between the October 1955 Hayride appearance to the end of 1955, it is amazing that no other live material has been discovered. The Las Vegas New Frontier Hotel 1956 performance will be familiar to most Elvis collectors but is notable here for, at last, having a complete and repaired ‘Long Tall Sally’. The 4 second “skip” @00:50 after “Uncle John needs” has finally been fixed. Bill Black’s bass-work has also been given more emphasis on this remaster. 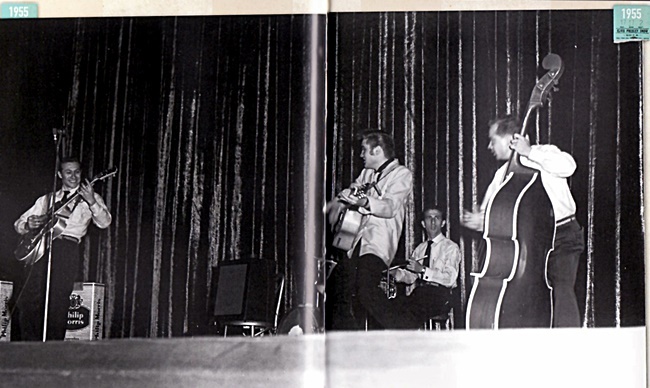 Elvis’ concert at Little Rock on 16 May 1956 is another key performance demonstrating Elvis breaking loose from the restraints of the staid Las Vegas setting and it would be the very first tour that The Jordanaires would play with Elvis. ‘I Was The One’ is a true highlight, along with the blistering ‘Money Honey’ sounding very different with Elvis bumping’n’grinding to his adoring fans! Elvis ends with the glory of ‘Hound Dog’ but remember that this was still May 1956, two months before he would record the single. In this day and age it is mind-numbing to hear the June Radio Spot telling the exact locations where you could buy tickets to Elvis’ concerts. Even funnier is radio promo for his Oakland shows noting “Elvis Presley will not play San Francisco so all of you don’t you dare miss it”! 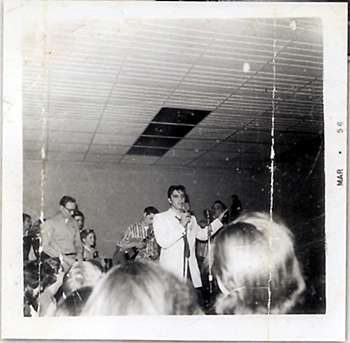 The second CD ends with Elvis Tupelo Fairgrounds Afternoon Show and, while not as well recorded as the Evening Show, it captures the excitement of the day as well as the "Presentation of the City Key" to Elvis plus a fabulous 'I Want You, I Need You, I Love You' as well as 'Ready Teddy'. 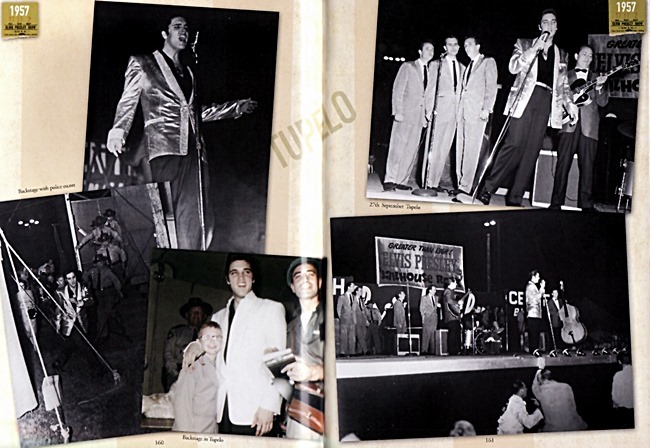 CD 3 starts with the Tupelo Fairgrounds September 1956 Evening Show and ends with some very short snippets from Elvis’ 1957 Canadian shows. 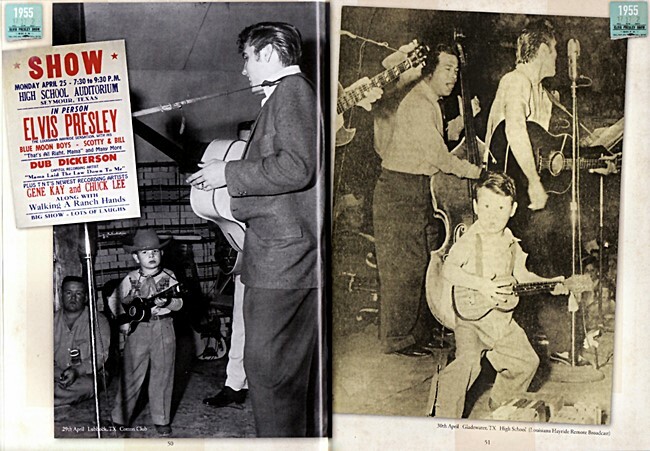 The Tupelo Evening Concert has a much clearer audio quality, as well as being a little wilder show, plus the addition of the fabulous song ‘Baby, Let’s Play House.’ The band is much clearer here, nice guitar work from Scotty Moore, and the screams less annoying. Elvis also adds a rockin' ‘Blue Suede Shoes’ to the setlist with the comment that the song is "getting kinda' old now." Looking back this is a cute little comment as, of course, Elvis would keep performing ‘Blue Suede Shoes’ until his last concerts in 1977! It also features a spectacularly crazy drum-break from DJ Fontana. Elvis has to beg "Would you please sit down" and the emergency announcements asking everyone to calm down, all add to the excitement. The bump and grind of the extended final 'Hound Dog' is fabulous. The final Hayride December 15, 1956 performance from the Hirsch Youth Center, Louisiana Fairgrounds, Shreveport is another key concert. MRS have nicely fixed up the first part of ‘Heartbreak Hotel’ with an edit from Elvis’ Tupelo concert - since it was missing from the original Hayride recording. The highlight has to be the only live version of the classic ‘Paralyzed’ and it’s a cracker. ‘Don’t Be Cruel’ is also a perfect un-rushed version, the tempo slowed down and imitating the Billy Ward and the Dominoes version that Elvis would have heard earlier in 1956 in Las Vegas. Such a brilliant version and so different from the throwaway seventies attempts. Similarly ‘Love Me’ is beautifully performed and now features the Jordanaires as his permanent backing group, ‘Love Me Tender’ is a lovely early version and ‘When My Blue Moon Turns To Gold Again’ is another treat from this classic concert. Elvis ends his final 1956 concert with an all-mighty ‘Hound Dog’ as his faithful fans scream their lungs out in love and appreciation. How amazing to compare this explosive fan adoration his first tentative Hayride performances. The ‘Elvis has left the building’ track is a lovely addition including "I told you absolutely straight up to this point that that he has left the building" – what a fabulous finish. The few final 1957 Canadian fragments only confirm all the reviews and newspaper articles that explain how Elvis could hardly be heard above the screaming of his loving audiences - even when the Toronto radio station was trying hard to record Elvis for their news. The selected responses from the audience afterwards is also fascinating, they include some great oddities. The little snippet of the live 'That's When Your Heartaches Begin' is all too tempting- what a shame the full tape has not been discovered. Two interviews from 1957, Portland* and Tupelo, nicely around out that these packed discs. I realise that most "serious" Elvis collectors will probably own the majority of these tracks already from multiple early compilations, some of which were in terrible audio quality. More recently the ‘Little Rock’ concert and the last Louisiana Hayride December 15th 1956 appearance were featured on SONY’s deluxe ‘The Young Man With The Big Beat’ boxset and ‘Eagles Hall’ was on the deluxe ‘A Boy From Tupelo’, while the Louisiana Hayride and Tupelo shows have also been on previous MRS releases such as "The Complete Louisiana Hayride Archives". But here they are all gathered together and remastered as uniformilly as possible. If fans couldn’t afford to buy the deluxe ‘Boy From Tupelo’ or The Young Man With The Big Beat’ box-sets then this represents a great value collection. For the “general public” who haven’t investigated Elvis’ live fifties performances in detail this complete set will be an eye-opener. Overall Verdict: Elvis Live In The 50s The Complete Concert Recordings continues MRS’s storied history of providing fans with sublime quality, value-for-money book and audio product. It is a journey through and a record of the most culturally, socially and musically impactful period of Elvis’ career. This release does not disappoint and will make a wonderful inclusion in any fan’s Elvis collection. EIN NOTE - Sometimes fans forget how lucky we are to have ANYTHING recorded from Elvis' early live performances. We can blame Col Parker here for not bothering to "waste money" recording any of Elvis' live 1950 performances professionally! See our great EIN interview with the Tupelo Engineer who recorded the Tupelo concerts without permission.